Spectacular panoramic views over the Big white dunes, estuary, sandbar and Little Barrier island from this elevated 2+ bedroom holiday home wrapped by huge decks nestled in private bush. The master bedroom and living areas capture the ever changing views. 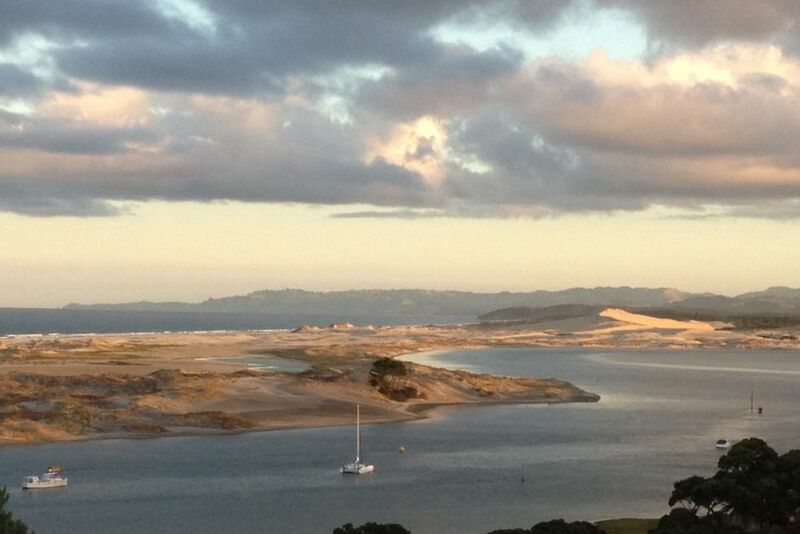 Play golf, fish, ski, surf/kite or wind surf or hire a kayak 5 mins walk at estuary. Miles of bays to explore, fishing charter to Hen and Chicks islands Or dig for cockles at low tide. Awaken to stunning sunrises from your pillow, or enjoy ever-changing reflections of the dunes in the estuary especially at sunset. Extra room with a cottage sleepout (queen bed+sofabed) is also private getaway, or extra day room or for those over night visitors, or teenagers!. Winter is cosy with the log burner fire. Watch the waves crash and the storm rage without getting wet! So much to sitting on the expansive decks soaking up the view and relaxing in privacy and peace is easy. The bach has a "casual kiwi relaxing feel'. 2 night min stay. Winter week +/ or midweek stays POA.. #*NB XMAS /NEW YEAR through SUMMER 5 nite min. school & ;public holiday/ weekends+ including EASTER peak . A real kiwi getaway .. casual bach with views from many different areas backvand front not only stunning sea views from inside and from decks , but different views from rear and above in the property . Bush and tree setting also . Cosy inside .. it’s a getaway from city .. not a custom but rental . It has evolved. And continues to change each year . The views are stunning while retaining privacy I love it here .. it’s not just a rental . ! It’s my soul place. Log burner Fire cosy in winter and log burner outside. Huge decks to enjoy sea views and sunshine while surrounded by trees as well . Another toilet and handbasin down in carport . Fully stocked for a family. Perfect location overlooking the estuary and very close to the surf beach. Perfect location overlooking the estuary and very close to the surf beach... the highlight of this Bach is definitely the front deck. This is our fourth summer at Magic-Mangawhai and we still love it whatever the weather. everything we need and awesome decks and views. We will be back can't beat it. This bach was perfect for our needs with incredible views from the balcony and spacious home - would definitely recommend this bach to others looking for a relaxing trip away. Absolutely stunning views. The pictures do not do this property justice. Very cozy and homely bach with a short walk to the estuary. Equipped with all the amenities needed for a fantastic summer by the beach. Stunning views and the house has everything you need for stay. Perfect weekend away for our needs! Perfect weekend away for our needs! We were a group of professional 30-something ladies, escaping the real world, and this lovely wee bach with the incredible view was exactly suited to us! There was plenty of space while still being cosy, and had a great CD collection for us! Excellent value for money.